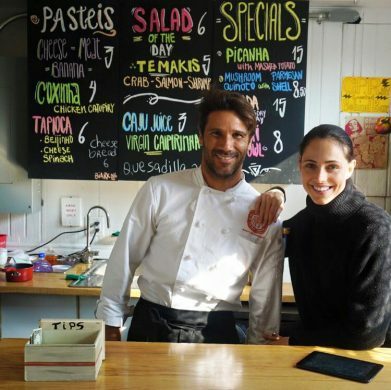 I’m not on many models’ speed dial, so I was surprised when New York-based Brazilian model Andressa Junqueira called me to tell me about a new restaurant that she and her husband chef Carlos Varella just opened in Rockaway last week. Called Beach Bistro 96, it’s taking over the space previously occupied by Anna Bow (and before that occupied by Veggie Island) to offer “Brazilian internacional fusion” fare, with dishes ranging from Brazil’s national dish feijoada (black beans with pork meat, rice, kale, orange slices and farofa), served on Wednesdays and Saturdays, to ratatouille and temaki sushi hand rolls. The signage that was covering up the goings-on inside of Galeria, Clinton Street’s new hybrid art-restaurant-concept shop, has finally been ripped down. Last night, we found Jairo Barros sitting in the back, a small chef’s hat on his head and his hands wrist-deep in beets as he tweaked recipes in preparation for the opening.